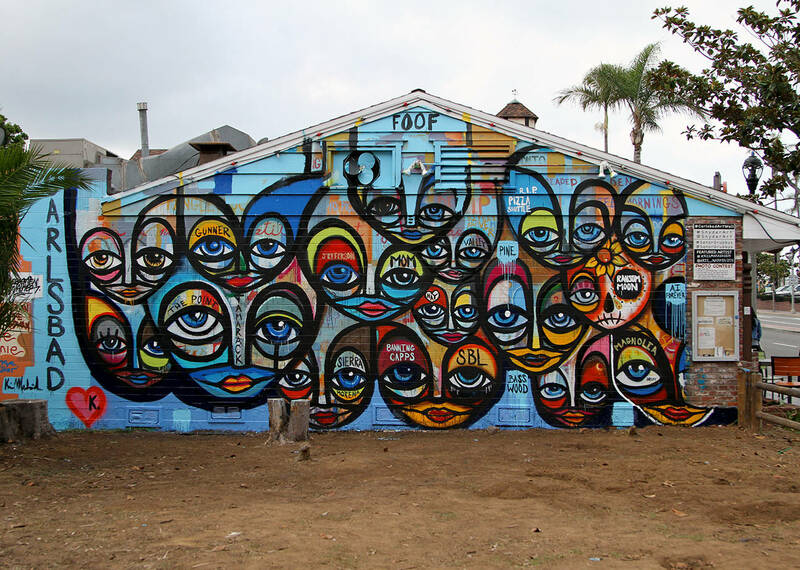 The Carlsbad Art Wall (est. 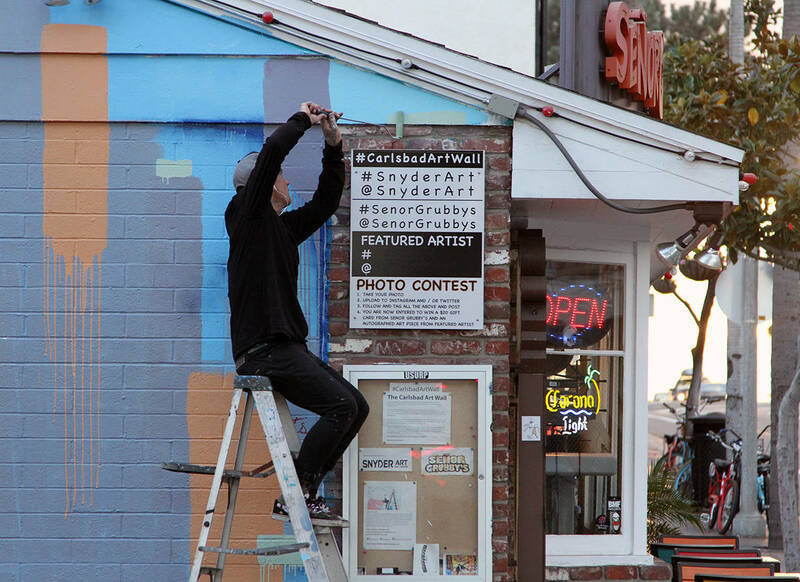 March 2015) is a cool project that local artist Bryan Snyder started to provide a platform to engage the Carlsbad community. 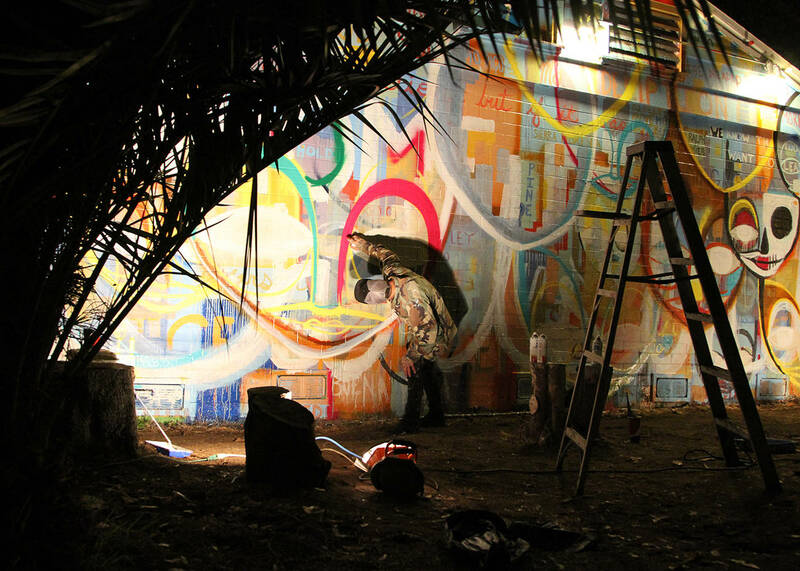 By serving as a conduit between aspiring artists and professionals, the Art Wall introduces a variety of new art and creative processes through the act of large-scale public painting. “Señor Grubby’s” is the location for this awesome rotating mural space, and Kris Markovich is the latest artist to bless it. Markovich is already synonymous with Carlsbad—thanks to his legendary Carlsbad Gap kickflip… and much more—so it only makes to have this emerging artist make his stamp. On Saturday, November 19, legendary skateboarding and emerging urban artist Kris Markovich painted a local tribute to his memories living in Carlsbad on the Carlsbad Art Wall (CAW) located on the east facing wall of Señor Grubby’s in the Carlsbad Village. Markovich had been eyeing the Carlsbad Art Wall for many months. He had driven by it. He had envisioned himself organizing his many supplies around it. He had dreamed of applying layers of paint to it—and he foresaw himself basking in all its triumphant glory. This mental exercise is not uncommon for Kris. As a teen growing up in Florida, his visualizations often became reality. His canvas had always been a collection of urban obstacles, but in his early days, Kris’ chosen art was skateboarding. His skating soon took him all over the world competing in contests, earning high profile sponsors and ultimately relocating himself and his family to the mecca of street skating—the Carlsbad Village by the Sea. 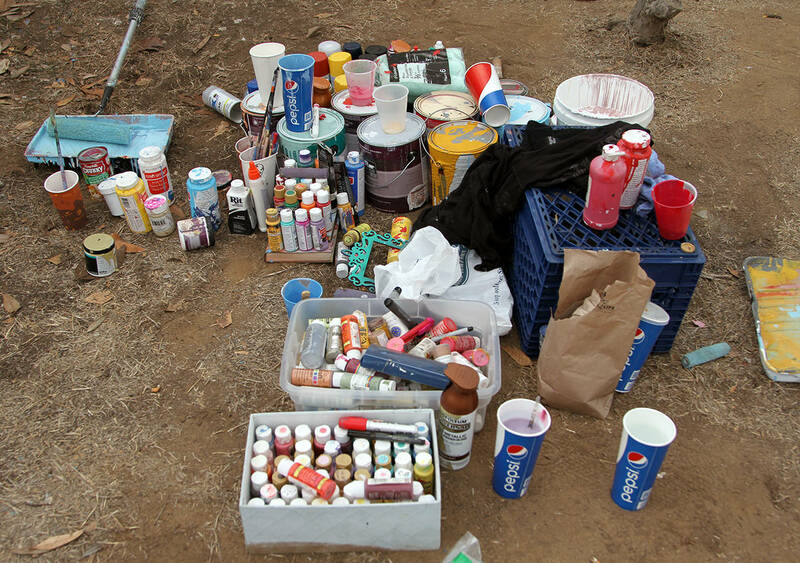 The large, intimidating and potentially dejecting Carlsbad Art Wall loomed. Kris approached the blank challenge with the same manner in which he used as a professional skateboarder. As if he and the wall were the only entities on the face of the earth, Kris mused while resurfacing months of visualizations. Suddenly, like the sharp click of a skateboard’s tail snapping upon the hard concrete, Kris sprung to his feet. Spraycans, brushes and rollers attacked as Kris balanced upon ladders. A palette of pastel colors quickly layered across the wall abstractly placed, but always in harmony. The wall’s entire face was quickly covered. It looked good, but Kris was only warming up with bigger tricks hidden up his tattooed sleeves. The sun began to set on this first day of painting, but Kris had no plans of stopping. 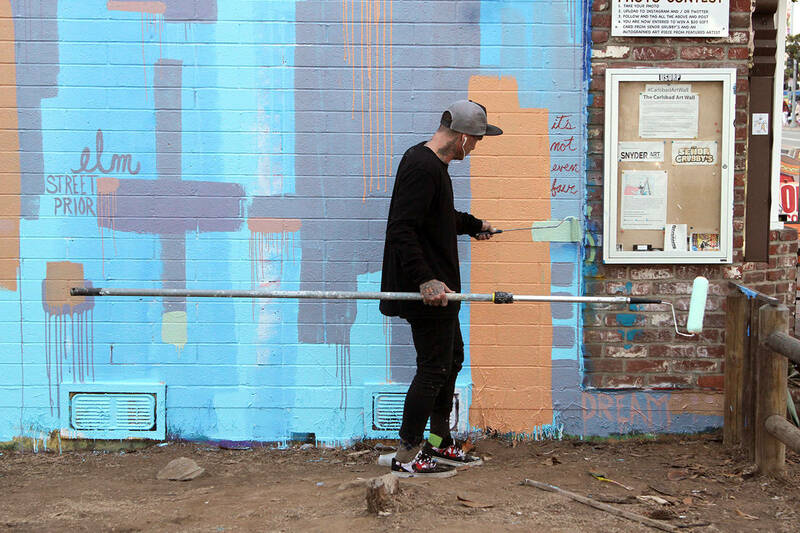 Passersby commented on the beauty of the wall, but Kris immediately responded that it was nowhere near completion and would take on a new and completely different shape once finished. After a few autographs with some young aspiring skateboarders, Kris decided to switch things up leaving his big, bold and fast repertoire for a more technical bag of tricks. Similar to the difference between a huge backside grab and a precise nollie hardflip, Kris shifted his approach to smooth lines of text. Onlookers cheered as each string of words elegantly glided across the concrete. Street names, phrases and tributes linked together in a poetic line of local pride. The crowd faded as the night melted in the early morning hours. Kris would have painted all night if it was not for an abrupt storm. As the rain started, Kris continued painting, but was soon forced to stop by a late autumn downpour. Kris hid in a pitched tent at the base of the wall and decided call it a night. Kris awoke late the following morning to find a full day’s work diluted, dripped and collected in colorful puddles within the muddy base of the wall. Some artists may have been deterred, but Kris had bigger and better tricks lined up. Kris attacked the wall faster and harder than ever, but scattered with long winded breaks. A crowd gathered, shocked with the evolution since the last time they saw it, whether the previous day or just in the time it took to devour a Grubby’s burrito. The following days progressed in quick bursts of creativity with long breaks during the day and passionate onslaughts of creativity throughout the night. 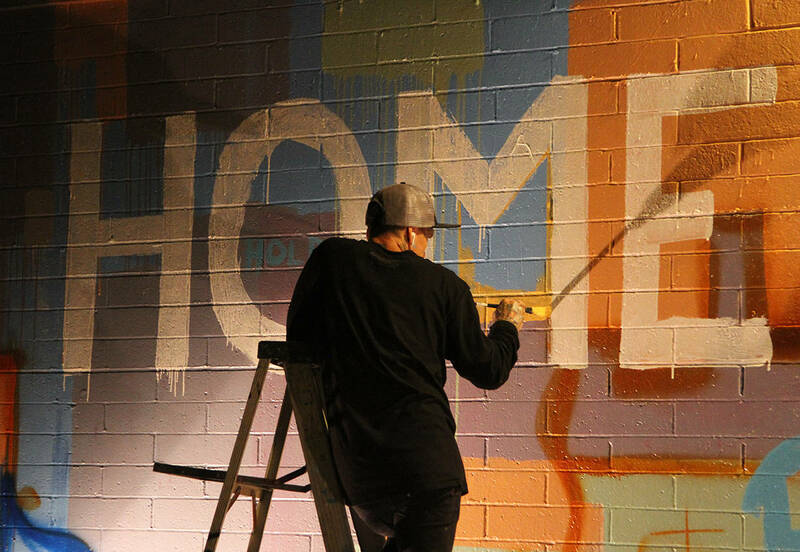 The community would awaken to a completely new mural each morning. Like a kid rolling around at a new skatepark for the first time, Kris did not want to leave. And like that same kid, after hours, no matter how much fun that kid is having, he is going to take some slams, bruise, hurt and leave a piece of himself bloodied upon the concrete. Kris loved each day of painting, but was also feeling his own collection of slams. Time was running out, supplies were low and the pressure to complete the wall and land his final trick was adding up. A mental strain began to wear on Kris. Accompanied by a week of long cold nights, rain and a lack of sleep, his state drifted toward manic. Under these conditions, the most solid mind would have faltered, but Kris regained composure and refocused on the prize. Kris had bounced back and forth from bold fast strokes to technical text based thoughts during his week of painting. In the remaining hours, and for the first time, he married the two. Aged text from days prior left ghostly reminiscences and new text danced on beat with colorful faces. Thick black outlines compartmentalized saturations and a homage to Carlsbad flanked the outside. Before Kris started his mural on the CAW, he imagined himself rolling up to the wall, clicking with his supplies, hurling his body across the obstacle and landing safely and triumphantly upon the ground for all to marvel at. 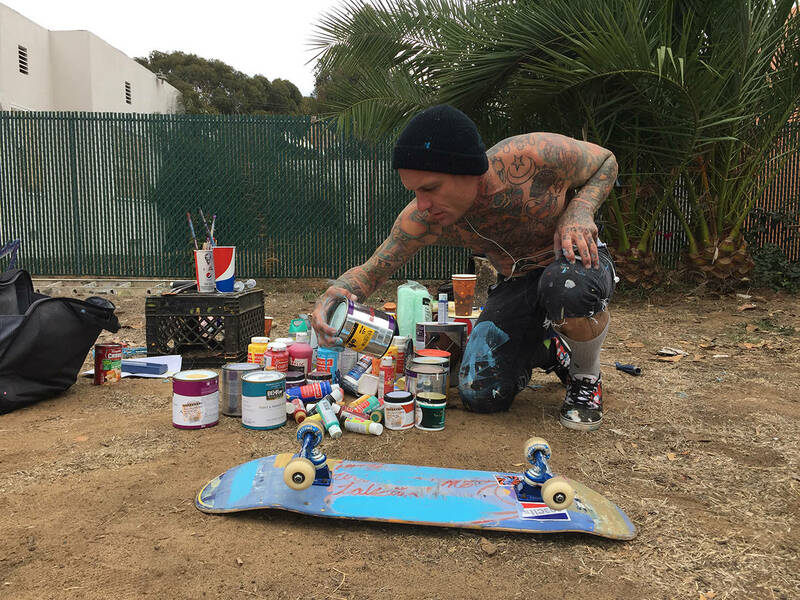 It worked for him throughout his skating career—and it worked for him on this cold and wet week of painting in Carlsbad. Thanks to Bryan Snyder and Carlsbad Crawl for sharing this rad story with The Berrics!